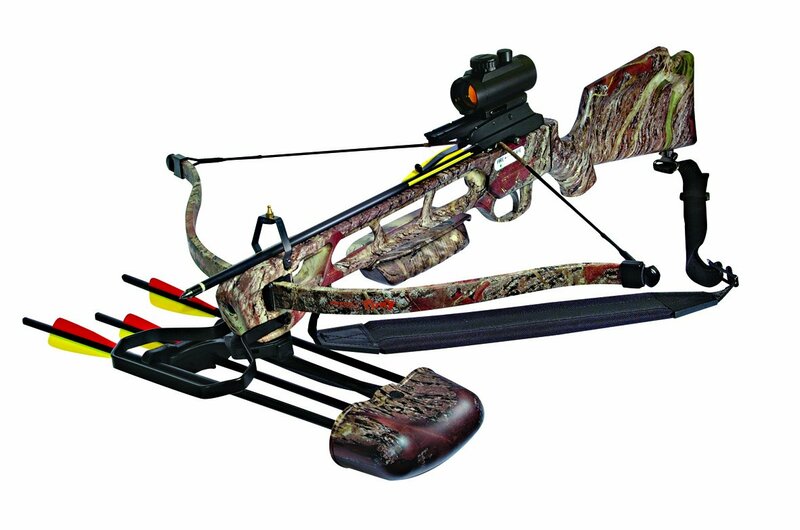 The popular Inferno Fury Crossbow Kit from Arrow Precision provides everything a seasoned crossbow hunter needs in a lightweight package--and is also a great starter kit for beginners who are looking for a fully equipped package at affordable price. The Fury Kit comes complete with the Recurve Crossbow that provides 175 pounds of draw weight for an impressive velocity of 235 feet per second. The premium 3-dot multi range red dot scope, meanwhile, allows you to aim at your target precisely while the Weaver-style mount is easy to adjust. The kit also includes a quick detach quiver with four arrows and a shoulder sling that is padded for comfort. Designed for both right and left-handed operation, the crossbow has an ambidextrous auto safety and an ambidextrous rear stock. The Inferno Fury Crossbow Kit carries a one-year limited warranty from Arrow Precision and comes with all assembly hardware included. Disclaimer: Bestfirearmdeals.com does not sell any products on this site. We are here to connect buyers with sellers for the best possible price. Any firearm purchases must be done in accordance to state and federal laws.